Sometimes I see a headline that reads like a Mad Libs sentence, a mish-mash of topics that really, I never expected to see together. Take, for example, Scott Pruitt + wife + Chick-Fil-A. But it’s 2018, so of course this is a real story. 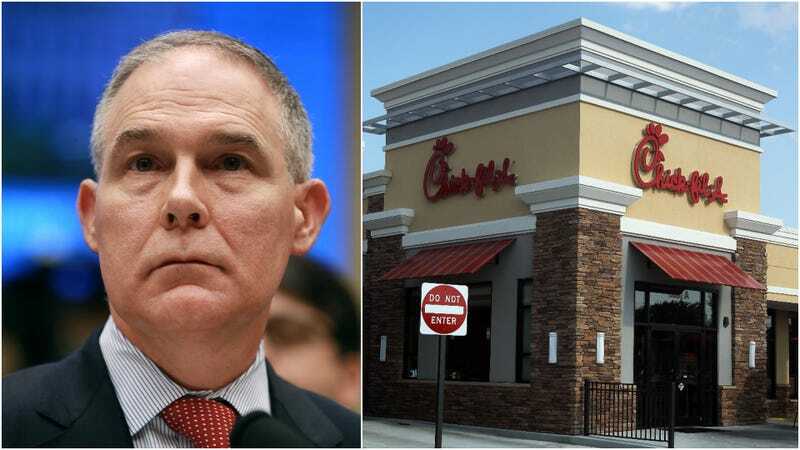 The Washington Post reports that recently uncovered emails show the embattled head of the Environmental Protection Agency, Scott Pruitt, asked aides to spend time scheduling conversations between himself and Chick-Fil-A so he could explore the possibility of his wife opening a chicken franchise. Nothing can surprise me anymore. Currently the subject of a full dozen federal probes related to questions of ethics and the mingling of business with personal affairs, Pruitt apparently was “eager for his wife to start receiving a salary” and asked aides to schedule calls with Chick-Fil-A and other businesses on her behalf. Ultimately, Marlyn Pruitt did not franchise the Chick-Fil-A, the restaurant told The Washington Post, but she did initiate an application. In case we need a refresher, ethics laws prohibit public officials from using their position or staff for private gain—even if that gain is a job peddling tasty chicken sandwiches. The Post quotes Don Fox, the Obama administration’s head of the federal Office Of Government Ethics, as calling the request a “misuse of the aide’s time” and a violation of ethic rules that prohibit officials from using aides to complete personal tasks. Recall that Pruitt is the same official who sent the same aide to score him a used Trump Hotel mattress.